With the Perioscope, we can treat over 90% of our patients who have periodontitis without surgery. 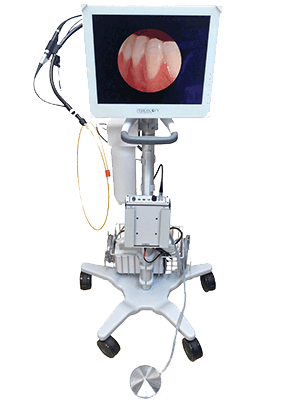 With state-of-the-art periscopy, we can treat most patients who have gum disease without surgery. 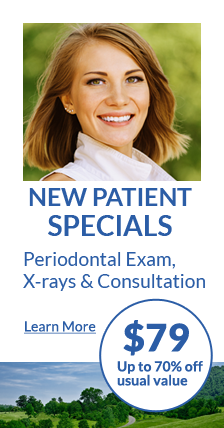 If periodontal surgery has been recommended for you, please contact us for a free second opinion. We use the periscope to treat moderate to severe gum disease without surgery in over 90% of our patients. The Perioscope is a specifically designed, tiny oral camera that is used to explore the inflamed pockets between gums and teeth. Highly magnified images are transmitted to a monitor, allowing for views of calculus buried between teeth, between roots and around corners that cannot be seen with dental loupes alone. This advancement in dental technology provides our doctors and hygienists with a tool to go beyond traditional deep cleaning without the use of a scalpel or laser. 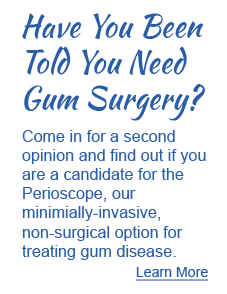 Come see us for a free second opinion and find out if you are a candidate for the Perioscope. It is easier, less costly and the results are better than traditional or laser surgery. Call 412-201-0633 or schedule an appointment online for a Free Second Opinion. The Periscope replaces periodontal surgery in most cases! Perioscopy is no more invasive than regular deep cleaning, which involves scaling and planing of the root’s surface. A local anesthetic is used to dull any potential discomfort, and the procedure takes between one to two hours to complete. Because the Periscope gives us close-up views of the area that requires treatment, we can avoid flap surgery in most cases. Flap surgery is a procedure using a surgical opening to give a clear view of, and access to, the area that requires treatment. Image courtesy of Perioscopy, Inc. It stands to reason that to be able to effectively remove hardened calculus, you need to have a clear view of where it is located. The Periscope gives us that view with highly magnified images – up to 40x – which we use to guide the precise, thorough removal of calculus. Using microsurgical instruments, we can reach the deeper areas where calculus has hardened and created inflammation of the gums, and gently remove it. Removing calculus creates a smooth surface on the root of the tooth. Since it’s difficult for bacteria to adhere to the freshly smoothed surfaces, your gums can regenerate without further irritation. The gum tissue will subsequently shrink, tighten, and reattach to the teeth. The results we’ve achieved with the perioscopic treatment are more effective than with regular gum surgery or laser-assisted gum disease treatment, and without the post-operative discomfort associated with surgical procedures. 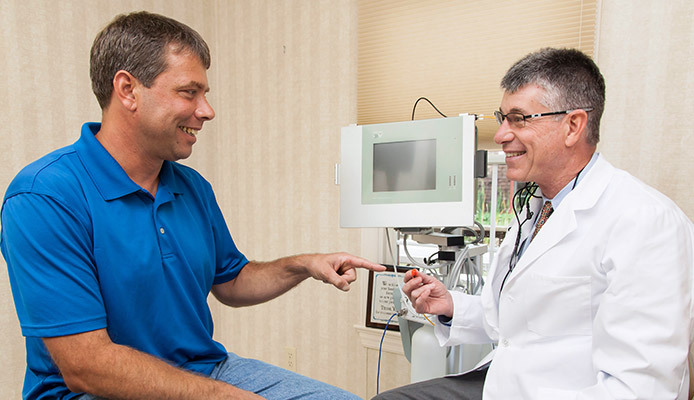 In over 90% of our cases, we have been able to successfully avoid surgery by using perioscopic treatment. Our doctors use the Perioscope’s tiny camera to view the diseased root surfaces. They then use special miniaturized instruments to remove plaque and calculus from areas of the root. Image courtesy of Perioscopy, Inc.
As always, your comfort is a top priority; we never allow our patients to be in pain. Treatment with the Periscope doesn’t leave you with the post-operative discomfort associated with surgical procedures. An additional benefit is that the highly effective perioscopic treatment is much more affordable than traditional or laser-assisted surgery. Jodi shows a patient the Perioscope used for non-surgical treatment of gum disease. The purpose of periodontal therapy is to remove bacteria from the surfaces of the tooth root and deter its regrowth. Calculus (hardened dental plaque) provides a rough surface that harmful bacteria can easily attach to and regenerate over time. Lasers do not remove calculus, they simply disinfect it. For this reason, it hasn’t yet been determined if laser therapy will stand the test of time. The highly magnified images displayed on the Periscope monitor show us exactly where the calculus is located. We can then gently and thoroughly remove this porous material that may continue to attract and harbor harmful bacteria. Optimum removal of calculus results in a better outcome and improved oral health, making perioscopy a more effective means of treating gum disease in over 90% of our cases.